Even with the World Series of Poker going on in Las Vegas, PokerStars should see a tremendous increase in their online poker traffic in the coming days and weeks as the site prepares to deal their historic 100 billionth hand, which is expected to happen sometime towards the end of the month. The countdown to Hand Number 100,000,000,000 began several years ago, and soon the culmination of the site’s Road to 100 Billion promotion will come to a head, with several lucky players striking gold with the cash and prizes being awarded. 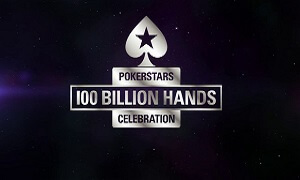 The biggest prize will go to the winner of the milestone 100 billionth hand, but all along the way, beginning at hand #99,700,000,000 PokerStars will be giving away prizes every 1 millionth hand. For the historic 100 billionth hand the winner will receive at last $100,000, with everyone at the table pocketing at least $10,000; additionally, every player participating in the game and stakes when the 100 billionth hand is dealt will earn a piece of the remainder of the $1 million PokerStars has set aside for the 100 billionth hand. Remember a few years back when Full Tilt set the record for the largest poker tournament in poker history, and then a few hours later PokerStars smashed the record? Well PokerStars is back at it, with a $1 buy-in tournament featuring a $300,000 guaranteed prize-pool. The current record stands at 200,000 players. On June 30th PokerStars will be offering their customers the chance to participate in a $1 million freeroll of sorts. To become eligible for the $1 million freeroll (which is guaranteeing $50k to the winner) you must do one of three things: Your first option is to deposit $50 or more at PokerStars which will automatically qualify you for the tournament: Option #2 is to answer a daily trivia question with 50 players receiving tickets for the Ultimate Freeroll: The final option is to deposit between $10 and $49.99, for which you will receive a ticket to a 6-Man satellite Sit & Go tournament, the winners of these satellites will receive a ticket to the Ultimate Freeroll. PokerStars will launch a new weekly tournament on June 23rd, dubbed the ZOOM 100. The tournament will feature a $109 buy-in and will obviously be played with PokerStars ZOOM software. For the launch the site is offering a $1 million guarantee on the first ZOOM 100 tournament. During the week of June 17th through June 23rd PokerStars will randomly select Sit & Go tournaments as “Golden” tournaments. Golden S&G’s will see the prize-pool increased 2x, 4x, or even 10x. All real-money S&G Tournaments are eligible with the exception of satellite and Step tournaments. PokerStars is estimating they will award an extra million dollars during this promotion. The final promotion will see poker fans vote on their greatest poker hands of all time, with random winners being chosen to participate in a hand of poker where you can win money by playing the specially selected hand.